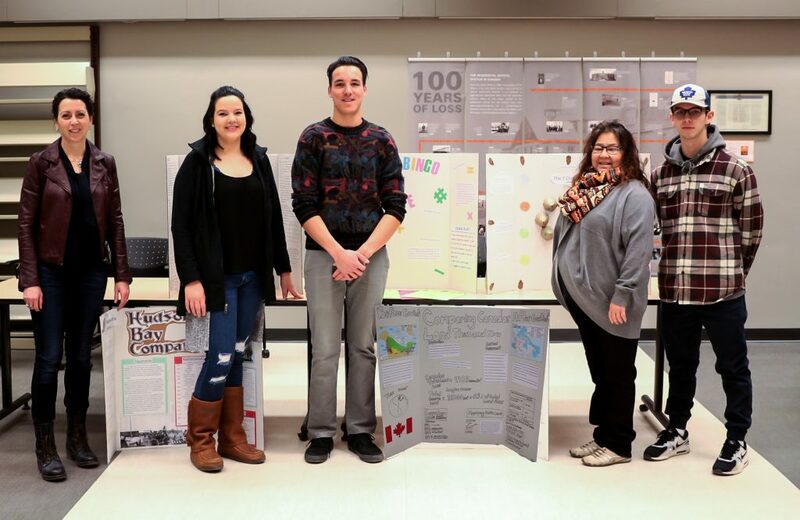 Sessional instructor, Shana Graham, with some of the Saskatchewan Urban Native Teacher Education Program (SUNTEP – Regina) Year 1 preservice teachers and their Mathematics 101 Mini Math Fair (final project) posters. 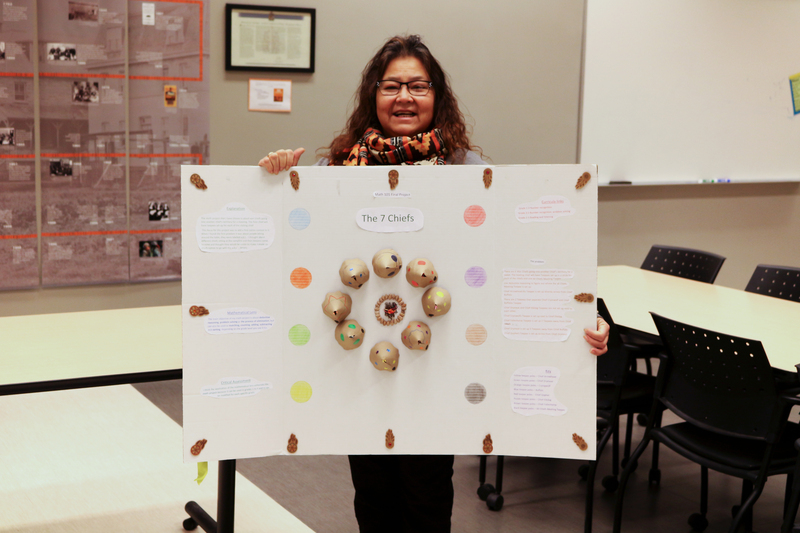 The concept of Indigenization is identified as “one of the University’s two overarching areas of emphasis” within the 2015-2020 Strategic Plan (https://www.uregina.ca/strategic-plan/priorities/indigenization.html). 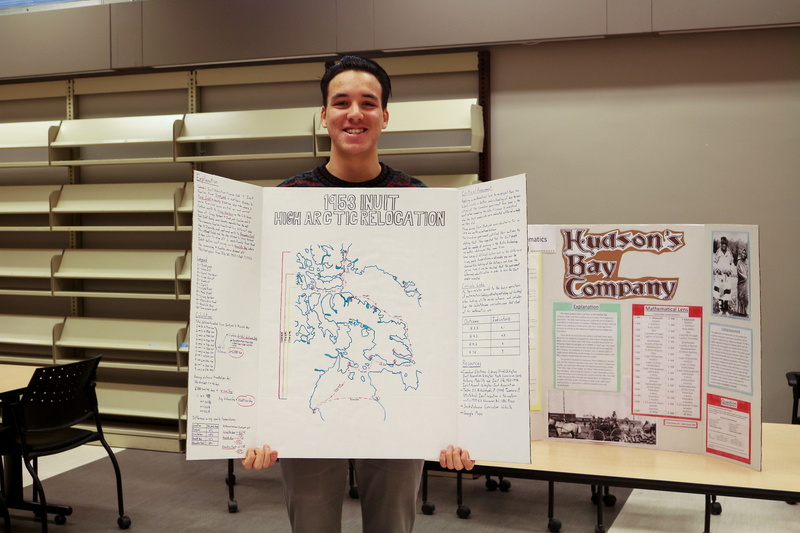 Depending upon the definition consulted, Indigenization may or may not be considered the work of settler/immigrant Canadians for it involves first-hand revitalizations of First Nations, Inuit and Métis languages, legal systems, and ceremonies, among many other aspects. 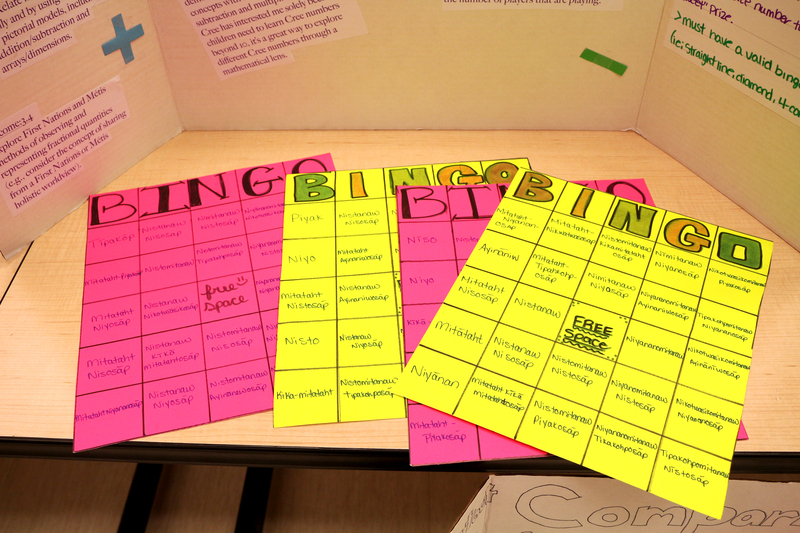 Indigenization, however, lies in relation with decolonization and thereby challenges all Canadians to work at disrupting and changing current institutions and systems, including those educational. 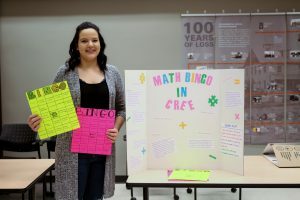 Thus, as a doctoral candidate of mathematics education, Shana Graham has been studying Indigenization and decolonization so as to inform her dissertation research which involves (re)imagining possibilities for mathematics education. 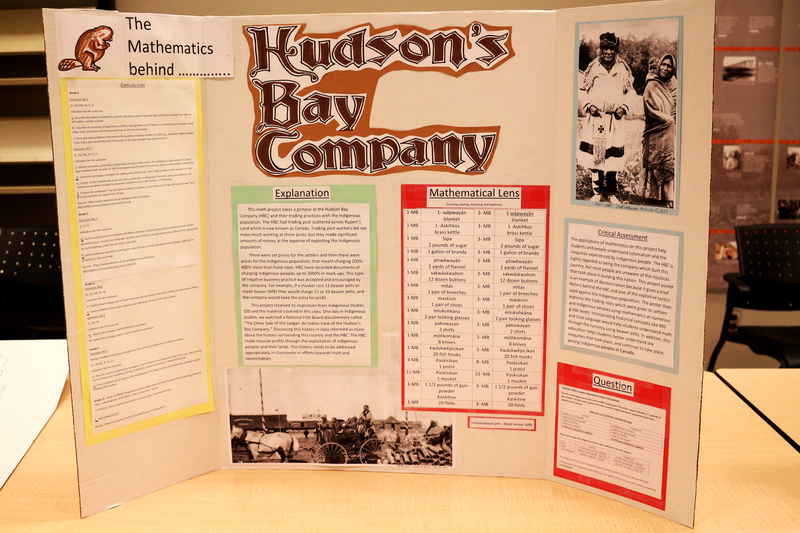 The idea for the implementation of a Mathematics 101 final project as poster and Mini Math Fair was informed by Show Me Your Math: Connecting Math to Our Lives and Communities, a program developed by Dr. Lisa Lunney-Borden and Dr. David Wagner (http://showmeyourmath.ca/). While a final poster project is not unusual within education courses, it is unique to a Mathematics 101 course. 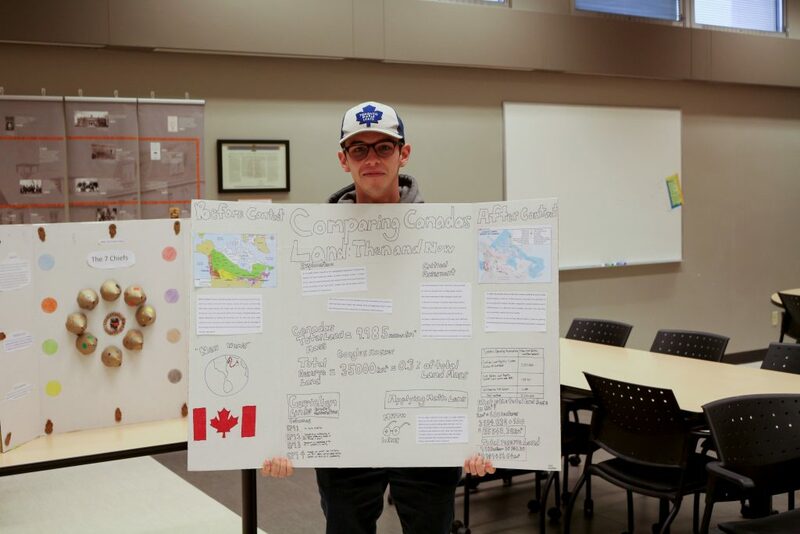 Decolonization, however, encourages considerations of context/community, which for this particular mathematics course involved only preservice teachers from the Saskatchewan Urban Native Teacher Education Program (SUNTEP-Regina). Thus, in adapting/decolonizing curricula for context/community, the arguments presented for changing the Mathematics 101 final evaluation from exam to project were accepted by Dr. Shaun Fallat, Head of the Department of Mathematics & Statistics. The support of Dr. Fallat and the Dean of Science, Dr. Farenick, need be acknowledged for reconciliatory acts may not otherwise be possible without the support of such powerful individuals.